Make a delicious savory broth without animal-based flavorings and MSG! 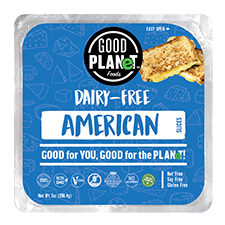 These gluten-free cubes are ideal for flavoring your stews, soups and pilaf dishes naturally with organic ingredients. 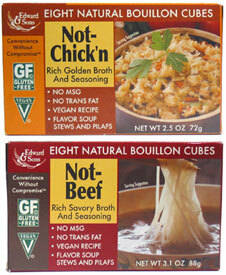 Each package contains 8 natural bouillon cubes. Available in 3 flavors- Not-Beef, Not-Chick’n and Garden Veggie. $2.99 per package. From JENNIFER MARA of CHICAGO, Illinois on 12/13/2017 . From Celeste Schwab of Portland, Oregon on 11/26/2017 . 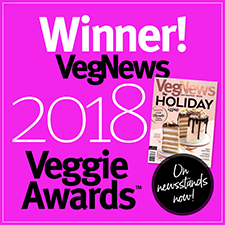 I've been veg for over 28 years. This is the only fake beef broth that I've found . I've used it in rice when making fried rice. In soups, just in anything I want to add the beefy flavor to. And non veg people like what is made with it. Which is a big win. I always have this in my pantry. From Emily of Anon, Florida on 12/29/2015 . These are beyond good! Both flavors taste very much like the real thing, and they are so much better than vegetable broth in many recipes. I like to make Asian-style noodles with this broth, as well as potato soup, mock-chicken noodle soup, and vegetable soup. I think the beef flavor tastes better than the chicken, but they're both very good and realistic. I even make the broth plain and just drink it by itself sometimes, especially when I'm down with a cold. This is definitely a five star product for me, and one I always make sure to have on hand. From Anonymous of Las Vegas , Nevada on 10/16/2014 . It taste great as a plain soup when your on the go. From Anonymous of Southgate, Michigan on 2/24/2014 . This bouillon is alright. It's available at a local store for emergencies, but it is not my bouillon of choice. When using it for soup, when it starts to cool, it will get a very gross film on the top. So while your pot of soup might still be warm, the very top will have cooled in the air causing this film. So, in a pinch it will work for whatever you need, but it would not be my first choice.